There's lots to like about the BT7, including its flexibility, performance and connectivity – just be aware of the issues pertaining to buying from abroad. 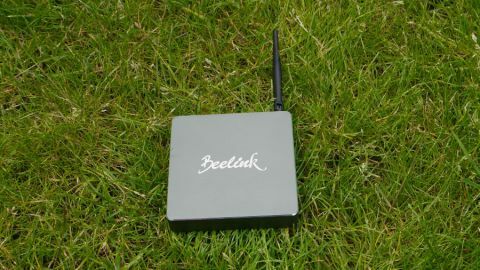 If there's something peculiar about the Beelink BT7, it's not the device itself but the box it comes in. You see, the container is highly reminiscent of the box which the Intel NUC (next unit of computing) mini PCs nestle inside. We would go as far to say that the box is a faithful reproduction of Intel's packaging. At any rate, inside said box, Beelink includes not just this palm-sized PC but also a driver CD, two HDMI cables (a long one and a short one), as well as a 100mm VESA bracket (plus screws) and a power adaptor. Mini PCs are all the rage at the moment and it is easy to see why. They are not only very affordable but also pack a powerful punch while not taking up a lot of space. The BT7 has a footprint that's a tad smaller compared to the recently reviewed Voyo V3, but it's far thicker. Being that thick allowed the manufacturer to throw in a protruding antenna to enhance Wi-Fi connectivity as well as a Gigabit Ethernet port, a full-sized HDMI port (v1.4) and an SD card slot, all of which were absent on the Voyo V3 (to the latter's credit, it still had mini versions of the last two ports). There's also three USB 3.0 ports, a big red power button and a headphone socket. Underneath the BT7, two pairs of black rubber feet can be found. Interestingly, there is a reset button (accessible via a small hole using a paperclip) to restart your PC should it crash. All the ports are clearly marked on the all-aluminium, ash grey chassis; it has a silver edge that runs around the top facia as well as slits on the sides for better cooling. Overall, it feels sturdy and well-built, not to mention cold to the touch which points to efficient heat dissipation. The BT7 is available in three different SKUs, all with 4GB of RAM, but with different storage capacities (64GB, 128GB and 320GB respectively). Gearbest, which provided us with the sample unit, sells the 64GB version for $169 (around £125, AU$225) with the code GBBT76, the 128GB one for $196 (around £150, AU$260) with the code GBBT72 and the 320GB variant for $250 (around £190, AU$330) with the code GBBT73. On the face of it, the latter model remains the best value for money, offering a five-fold increase in storage capacity for a 50% higher price. The cheapest unit only has 64GB eMMC memory while the more expensive models run with larger SSDs. Of course, there's nothing preventing you from buying the lowest-priced model and manually adding an M2 SSD later on when prices decrease further still. Other than the aforementioned V3, competition in this price range includes the Onda M2 (which is cheaper and uses a Celeron J1900 CPU) and the Vorke V1 (with a smaller drive, but again it's cheaper). As always, people need to be aware of the risks and challenges involved in buying from abroad. Before you commit to any purchase, it's well worth checking out our guide to buying tech from online Chinese retailers. Like many high-end Mini PCs, the BT7 runs on an Intel Atom X7-8700 CPU, a quad-core model clocked at 1.6GHz which can also be found in the Microsoft Surface 3 tablet. Based on Cherry Trail, it is manufactured using the finer 14nm manufacturing process, sports a 2W TDP and has 2MB of cache. It can support up to 8GB of RAM and does 4K albeit at 30Hz. Puzzlingly, the BT7 has a small, low-speed fan that runs all the time, and given that the processor also has a massive copper heatsink, this is something that shouldn't be necessary given the low-power dissipation of the Atom CPU. We suspect it is more of a safety precaution from the vendor to avoid any throttling in warmer territories or under harsh conditions (when used in a shop window for example). All the components are soldered onto the motherboard, but you should be able to swap the on-board M2 SSD for something beefier simply by removing the back-plate. The rest of the spec sheet includes Bluetooth 4.0, 802.11ac Wi-Fi and Windows 10 Home Edition. While no benchmarking was carried out on the BT7, we expect it to perform on par with the Surface 3 which has an identical processor and the same amount of system memory. The antenna coupled with 802.11ac should translate into much better wireless connectivity with the Gigabit Ethernet port providing a welcome option. Businesses will love the subdued look of the Beelink BT7, the amount of ports available, its affordable price, performance, versatility and the ability to mount it at the back of a monitor or television set. As a thin client, it is a shoe-in replacement for desktop PCs especially as Beelink bundled the driver CD with the PC. What will make a lot of potential buyers balk are the potential issues associated with importing these devices such as VAT and aftersales. In a worst-case scenario, 25% VAT (20% + handling fee) coupled with a 10% failure rate (assuming a company buys 10) adds around 30% to the price of the BT7. Given this, the base model starts to approach the £200 mark, and in this sort of price bracket a myriad of other options are available from retailers servicing the UK market. However, for businesses looking for the best value-for-money route and considering claiming VAT and stocking a couple of devices (just in case), the BT7 represents a great alternative to existing brands.